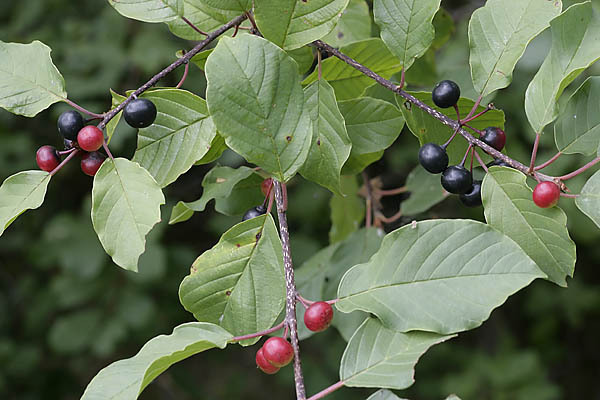 The fruits of the alder buckthorn are very TOXIC, they should on no account be eaten, and the bark of the tree is likewise toxic. The fruits of the alder buckthorn just now are as seen in Arne’s photo. At the moment most of the drupes, in which there are two little pits, are still red; autumn will paint all fruits black. In case there is any suspicion of poisoning manifested by vomiting, strong abdominal pains and bloody stools, the sufferer should quickly be taken to hospital. If charcoal tablets are at hand they may be given. Alder buckthorn is common in forests in West Estonia and the islands, but occurs in the shrub layer of forests in all Estonia. 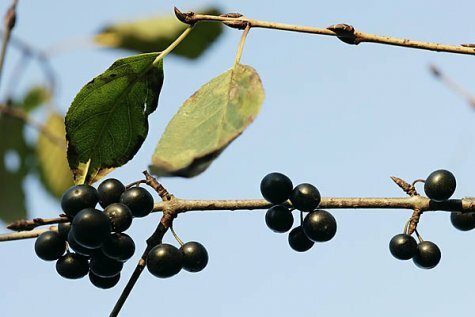 It grows as a shrub with dark bark, or as a multi-trunked tree, height up to seven metres. The pretty, white flowers of the tree, hidden among the leaves, are unobtrusive, but it quite often flowers for a second time in the latter half of August and in September. The bark of branches is dark and covered with whitish streaks. A very similar species is the buckthorn whose black berries ripen in September and are slightly toxic in that period.